Spring Melange - 112:365, originally uploaded by Judi FitzPatrick Studio. 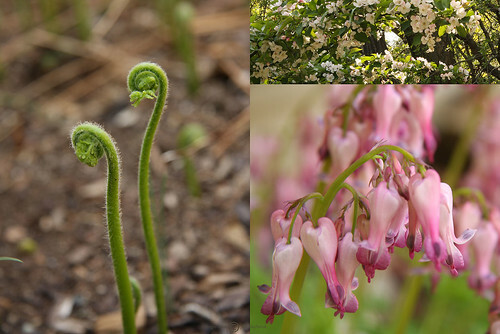 Unfurling ferns, bleeding heart, and crabapple all growing in my own yard. I couldn't choose one so put them all together here for your enjoyment. What a great time of year this is! Hi Judi, great pictures! Are those what they call fiddlehead fern? Marlene, thanks so much. I'm not sure if they are fiddleheads or not, they are just something that started growing near my gutter downspout last year. I was thinking they might be fiddleheads, too. We used to have a crabapple tree growing my neighborhood, in the outfield of our make-do ballpark (it was actually a large yard of a neighbor who didn't mind us playing there.) I always liked to eat a couple of them after playing, if they were ripe. Little bit on the sour side for apples, but still refreshing when I worked up a sweat. Jim, the crabapples do have great blossoms, and sometimes worthwhile fruit. Thanks for sharing your memories.